Some of the world’s fastest computers employ Nvidia’s graphics processor for computer vision, deep learning and scientific calculations, and a new GPU will supercharge these applications. The Tesla P100 that plugs into the PCI-Express slots of supercomputers will speed up tasks like economic forecasting and weather modeling. The GPU is also targeted at servers, and will play a big role in helping self-driving cars, robots and drones identify objects. Deep-learning systems with the GPUs in data centers will improve cloud-based image recognition, classification, natural language processing and speech recognition. One system with Tesla P100 chips is Nvidia’s DGX-1, which can be purchased for $129,000. It has eight Tesla P100 GPUs. 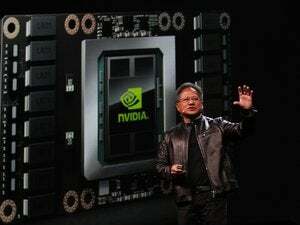 Nvidia said server makers like Cray, Dell and Hewlett-Packard Enterprise will start taking orders and delivering systems with the GPU starting in the fourth quarter this year. 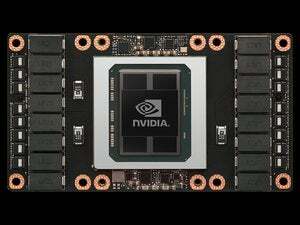 A version of the Tesla P100 GPU was also introduced at Nvidia’s GPU Technology Conference in April, but that was for the new NVLink interconnect. PCI-Express slots are in almost all computers today. The NVLink interconnect, which is five times faster than PCIe, will appear in IBM’s Power servers starting in the second half of next year. There are slight speed differences between the two Tesla P100 GPUs. The Tesla P100 for PCIe slots will deliver roughly 4.7 teraflops of double-precision performance, which is slightly lower than the 5.3 teraflops on the NVlink version of the GPU. The single-precision performance is 9.3 teraflops, compared to 10.6 teraflops on the NVlink version. The memory bandwidth is the same at 720 gigabytes per second with 16GB of internal memory. The Tesla P100 for PCIe slots memory bandwidth drops to 540 gigabytes per second with 12GB of internal memory. The Tesla P100 is based on the latest Pascal architecture, and packs new technologies that combine to provide significant performance breakthroughs than the previous Tesla GPUs. The Tesla P100 will work with CUDA parallel programming framework, which is Nvidia’s proprietary technology. The GPU will also appear in multiple supercomputers in the future, said Roy Kim, Tesla product manager at Nvidia.